"So it really was the butler this time." More Walthall articles to ponder. 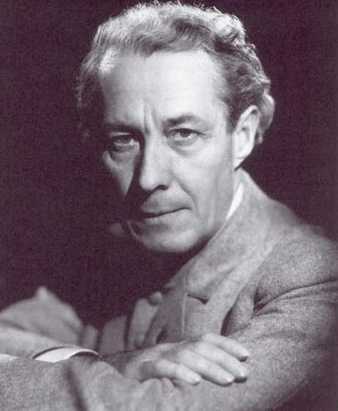 Los Angeles Times, "Henry B. Walthall, Film and Stage Actor, Dies," Thursday Morning, June 18, 1936, pp. 1, 10. Excellent obituary with two wonderful pics (including one in "Little Colonel" regalia with daughter Patricia). It does give an incorrect age of death, however. The article states he was 55, he was actually 58.
obituary issue June 18, 1936. 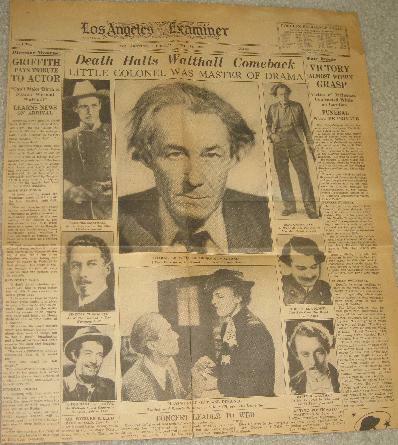 Los Angeles Examiner, "Death Halts Walthall Comeback," June 18, 1936, Part 2, pg. 1. Nice part two page one spread with 8 photos including one from China Clipper. D. W. Griffith's reaction to Walthall's death is described with Griffith ending all thoughts to remaking The Birth of a Nation as he could "never imagine any man taking the place of Henry B. Walthall in that picture." The funeral was scheduled for the following day (Friday). The place and time was not publicized. The services were to be private and held most likely in Beverly Hills with only about twenty of Walthall's closest friends, one of whom was to give a short eulogy. The simple nature of the funeral was definitely fitting for the humble actor as is the unostentatious plaque on his crypt at the Hollywood Forever Cemetery. Beautiful spread to commemorate a great career. I am very fortunate to have obtained an original copy of this obit. Appeal-Democrat [Marysville, California], "Walthall, Star of Films, Dies," June 17, 1936, p. 1. People picking up my hometown paper off their lawn in 1936, an evening publication at this time, read a tiny column on Henry's death just 12 hours after it occurred. What is interesting about this obituary is the statement that Mrs. Walthall and daughter Patricia expected Henry's death, but were unable to be at his bedside before the end. The Chico Record reprinted this point in its June 18 edition. This information contradicts the Los Angeles Times article which stated that Henry was visited by his family the Tuesday before his death. New York Times, June 18, 1936. Walthall's death did not receive front-page coverage in New York, but it did print his correct age and included a nice write-up with pic (not as nice as the LA Times pics). Sacramento Bee, "Career Ends," June 17, 1936, p. 1. This evening edition printed the news of Henry's 5:30 a.m. death on the same day it occurred. No new spin on the event in this small article although it includes a small photo of Henry that was probably taken during the 1935 Oscars when D. W. Griffith received an award. San Francisco Chronicle, "Walthal [sic] Dies," June 18, 1936. This Obituary misspells Walthall's name twice (once in the headline), names the famous director David Mark Griffith (I guess he was D.M. Griffith), and, like the New York Times, prints the erroneous age of death at 55. If the veracity of this article can be trusted, it does offer a more detailed account of Henry's work during his last film China Clipper. I have included this information in the review of that film. The obituary includes a Judge Priest era photo. 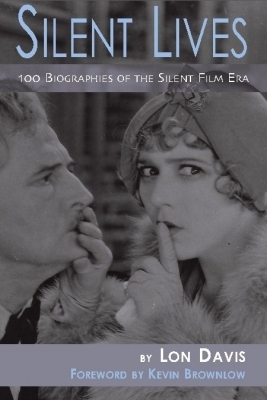 Silent Lives: 100 Biographies of the Silent Film Era by Lon Davis with a Foreword by Kevin Brownlow. HBW is 1 of the 100, of course. Get a FREE Bonus DVD of 2 hours of rare footage when purchasing the book directly from the BearManor site. Blum, Daniel, A Pictorial History of the Silent Screen, New York: G. P. Putnam's Sons, 1953. This book is bursting over with silent screen photos. Many small shots of Walthall although not as many as I would like and that I think he deserved in a book such as this. I was also disappointed he did not get a full-page photo as several other stars received. Screen shots of films like The House with Closed Shutters, Single Wives, and His Robe of Honor are invaluable. Bodeen, DeWitt, "Betty Bronson," Films in Review, December, 1974, pg. 584. Includes photo of Walthall and Bronson from Everybody's Acting. It is a wider view of a close-up in the Griggs' article in an earlier issue of this publication noted below. Bowser, Eileen, Biograph Bulletins 1908-12, New York: Octagon Books, 1973. This 471-page book compiles bulletins for nearly every Biograph short through 1912. Each bulletin includes a still from the film and a synopsis of the plot. This book offers many pix of Walthall which, although not of the highest quality, are very rare. Bowser, Eileen, Edited by Charles Harpole, History of the American Cinema, 1907-15: The Transformation of Cinema, New York: Charles Scribner's Sons, 1990. Walthall is mentioned several times with pics from his first film A Convict's Sacrifice (pg. 46), Home, Sweet Home (p. 247), and with "friend" (a skeleton) in Avenging Conscience (pg. 266). Another Home, Sweet Home pic on page 47 is credited to him, but is actually someone else during one of the HSH stories without Walthall's character. The pic is really of Courtenay Foote. Henry pictured in Floyd Clymer's historical album Cars of the Stars. Clymer, Floyd, Cars of the Stars, Los Angeles: Floyd Clymer, 1954. Picture book that includes Walthall on page 8 under the heading "Tender Moments." No, he is not in a car, but is pictured in a still from a 1920s film. He is knelt down next to a little girl presumably winding up a toy. 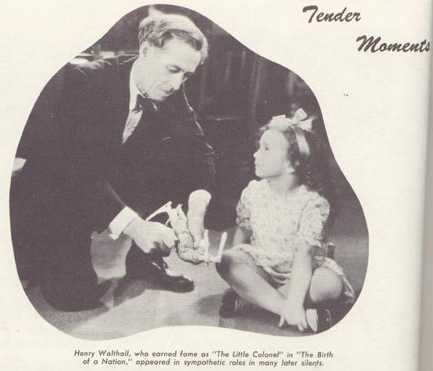 The caption reads that the "Little Colonel" "appeared in sympathetic roles in the later silents." Franklin, Joe, Classics of the Silent Screen, New Jersey: The Citadel Press, 1959. Includes reviews of Walthall flicks Birth of a Nation, The Scarlet Letter, and Wings as well as a biography on pages 240-1. Six total photos (3 in the bio). Gartenberg, John, "D.W. Griffith at the Museum of Modern Art," Films in Review, February 1981, pp. 91-104. Details the museum's acquisitions of Griffith's works. Includes a photo of Walthall in Death's Marathon on page 97. Griggs, John, "Here Was An Actor," Films in Review, March 1952, pp. 118-24, 131. Wonderful article written by a true fan of Henry's who was overcome by the "magic of Henry B. Walthall" after seeing The Confession when he was 12. Griggs traveled to out of the way movie houses to catch a Walthall flick. He even met with Henry's last surviving brother, Wales. I was so impressed by the sincerity of the author's admiration for Walthall that, for a brief moment, I thought about trying to contact Mr. Griggs. Then it dawned on me that this article is 50 years old (time is ruthless). Anyway, it includes 6 uncommon photos. I could not resist including this little gem. I found it "very interesting" to discover a Road to Mandalay still of Lon Chaney and Henry Walthall used as a gag photo for the history of Burbank in the November 1968 issue of Laugh-In magazine (pg. 46). We can now add "Grover Glendale" to the list of Walthall's hundreds of roles. Hoffman, Walter "Slim", "Blowing Up Hollywood," Popular Mechanics, August, 1947, pp. 154-8, 228, 232, 236. Hoffman, the explosives engineer at Paramount Studios, named Henry B. Walthall (and Gloria Swanson) as one of the bravest actors he worked with: "Walthal (sic) was once buried under 12 feet of dirt and it took 6 minutes to dig him out. His only comment when dragged from his temporary grave was: 'Great work, Slim'" (pg. 236). Katchmer, George A., Name of article unknown, Classic Images, January, 1989. This source used to be on the Internet, but is no longer available. The article originally appeared in the above publication, but I do not have the issue to obtain page numbers for references. Lahue, Kalton C., Gentlemen to the Rescue, New York: A. S. Barnes & Co., 1972, pp. 223-29. Has two pages of bio and five pages of 7 pics. Singer, Robert, "Character and the Little Colonel," Films of the Golden Age, Summer 1997, pp. 56-57. This article details Walthall's performances in Birth of a Nation, Judith of Bethulia, and--especially--Avenging Conscience. Includes a nice photo of Walthall with mustache and cigarette (one I have not seen before). Slide, Anthony, The Idols of Silence, New York: A. S. Barnes and Company, 1976. Includes chapter on Walthall and a rare full-page early portrait of the actor with an anguished, tortured soul look on his face. Slide I in biography notations. 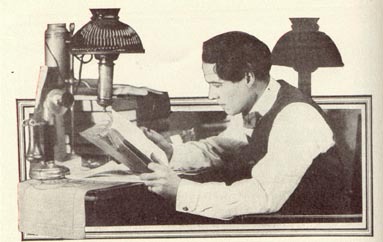 Uncommon later photo of Henry in Anthony Slide's book Silent Players. Slide, Anthony, Silent Players, Kentucky: University Press of Kentucky, 2002. Biographical entry with rare later photo. Slide II in biography notations. Stuart, Ray, Immortals of the Screen, New York: Bonanza Books, 1965. Walthall's mini bio and pictorial are on pages 212-213. Six pics, all of which can be found on the Silent Gents site (see my Links page). The book includes movie credits with the photos. Wagenknecht, Edward and Anthony Slide, The Films of D.W. Griffith, New York: Crown Publishers, 1975. A look at the big productions with lots of screen shots, including Home, Sweet Home, The Avenging Conscience, The Birth of a Nation, and The Great Love.